THE NEW $120 MILLION IRVINE SPECTRUM MARRIOTT IS THE FIRST FULL-SERVICE HOTEL TO HIT THE MARKET IN A DECADE, AND DEVELOPER R.D. OLSON SAYS THAT IT FILLS A BIG HOLE IN THE MARKET. The first full-service hotel in more than a decade has opened in Irvine. R.D. 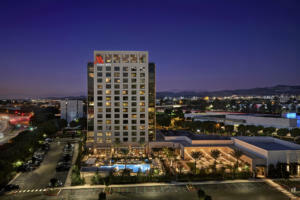 Olson Construction has completed construction of the Irvine Spectrum Marriott, a $120 million 15-story full-service hotel. The project fills a void for high-end product in the market, which is popular for leisure and business travelers. It will specifically target millennial travelers with a host of amenities and food and beverage options. The developer plans to hold the property for the long term.